Recently I have been using variations of blues and greens for capturing water in my koi paintings. Since water is clear and reflects its surroundings you can use a variety of colors to create water and its reflections. Water also provides ever changing abstract shapes, which offers limitless ideas for painting. Using Gamblin’s Pthalo colors, which are all transparent, I have been presented with many possibilities to create a vibrant oil painting. 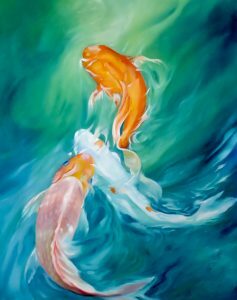 When I painted “Koi Trio 2” I used Gamblin’s Pthalo Turquoise, Pthalo Emerald, Hansa Yellow Lite, and Radiant White. I toned my primed canvas ( masterpiece portrait smooth) with these colors. I used Gamblin’s Neo Megilp as my medium which dries to a workable surface in about 2-3 days. I then sketched the koi in place with radiant white to make the koi appear to be moving. I use my photos from different areas of travel as my references. The orange koi I used transparent Napthol red and Hansa yellow lite. The white koi is radiant white with spots of my mixed orange. The bottom koi has the same mixture for the orange with extra white. I used turquoise for the bluish eyes and darken the middle of the eye with dioxazine purple. The body of the bottom koi was a challenge. The mixture was mostly radiant white with orange. After a few days of drying I added a very lite glaze of violet over the body of the koi and the shadow area at the lower body of the koi I glazed with quinacridone red. I was able to keep this painting very “loose” and it was exciting to do.